Charles-François Gounod (French: [ʃaʁl fʁɑ̃swa ɡuno]; 17 June 1818 – 17 or 18 October 1893) was a French composer, best known for his Ave Maria, based on a work by Bach, as well as his opera Faust. Another opera by Gounod occasionally still performed is Roméo et Juliette. 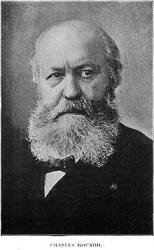 Gounod died at Saint-Cloud in 1893, after a final revision of his twelve operas. His funeral took place ten days later at the Church of the Madeleine, with Camille Saint-Saëns playing the organ and Gabriel Fauré conducting. He was buried at the Cimetière d'Auteuil in Paris.